Voice your opinion! Review gproslaw now. 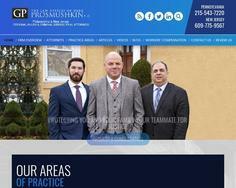 The Law Offices of Greg Prosmushkin, P.C., provides a full complement of legal services to people in Pennsylvania and New Jersey. Their experienced attorneys are well versed in legal areas such as DUIs, Drivers License Suspensions, Traffic Tickets, Divorce, and Car Accident cases. Also, they are fluent in several languages, including Spanish, Russian, Polish and Ukrainian. They take the time to thoroughly discuss each client's needs and goals, and maintain good communication throughout the duration of each case. For a free consultation with one of their lawyers, please call at 215-543-7220 (Philadelphia) or 609-257-4976 (Trenton). Led by founding attorney Greg Prosmushkin, who has nearly 20 years of legal experience, their firm provides intelligent, cost-effective representation for individual and business clients throughout Pennsylvania and New Jersey.